January | 2012 | Heart, Soul, Strength and Mind. because everyone who is born from God has overcome the world. Our faith is the victory that overcomes the world. I like Mr John Zebedee, dude of a temper and volatility so notable that Jesus nicknamed him and his brother James as ‘Boanerges’, Sons of Thunder. He was vain enough to mention pointedly that he sat with his head on Jesus’ chest at The Last Supper, loyal enough to have stayed at the Cross, lucky enough to have witness the Transfiguration, strong enough to have endured being boiled in oil for his faith, and cool enough to have shown no effect. Do I have the courage to be deep fried for my God? In my bones, I think not. So what empowered this man to go this far? What was the engine with him that ensured he fought the good fight? When this gentleman speaks of faith, he has earned our consideration in spades. We all have great faith. Most of us have most of our faith in nonbelief and disbelief. It sustains us. It informs us. It takes us through. Some of us have plenty of faiths. All kinds of faiths. Lucky clothes, colours and calculations. Lucky days and people. Signs, omen s and talismans. Shooting stars and dandelion feathers. Eyelashes on fists. Horoscopes, astorology, palmisty and psychics. Wow, the crap we set the course of our life by. Faith in the universe of true faith in a true God for a true reason and a true hope. Faith is exhausting. We have to think through it. We have to remember the landmarks. To remember we have to commit to memory. We have to STUDY it. We have to practise it. Faith will engage the marrow in your bones and ask, demand and insist. Faith can be as painful as it is palliative. Faith kept John’s nerve when boiling in oil, and faith kept his course steady after the hot oil had proved ineffective. He doesn’t mention it anywhere. I see his faith enjoying the miracle, and he did not bother to stand out and bleat a teatimony. It was his private joy, such was his faith. We fake faith. Occupying ourselves with Christian pleasantries is so much easier. And so much more fun … sing and clap and dance and airkiss. It is so much easier to belch a Praise The Lord or burp an AMEN! So much easier to make cooing sounds, distribute warm hugs and visits. All of which is wonderful when you are easing a new brother or sister into your Church, but how many of us realise that it is bordering on betrayal when that composes most of your Christian life for years on end. Jesus did not die on the Cross so that you and I could be social milquetoasts. Saccharine behaviour does not a Christian make. There are millions, indeed hundreds of millions of people who are not Christians yet they are wonderfully behaved people, living by a robust moral code, pillars of their home and society, a credit to their workplace ….. and they do not have FAITH. Do I have faith? Does it guide “every breath I take every move I make”. Do I live as if God is telling me “I am watching you”? In John 16:33, the Saviour says, “Be of good cheer; I have overcome the world.” Do we radiate that overcom-ness? Do we believe that the lifeforce in us is the lifeforce that has “overcome the world”? 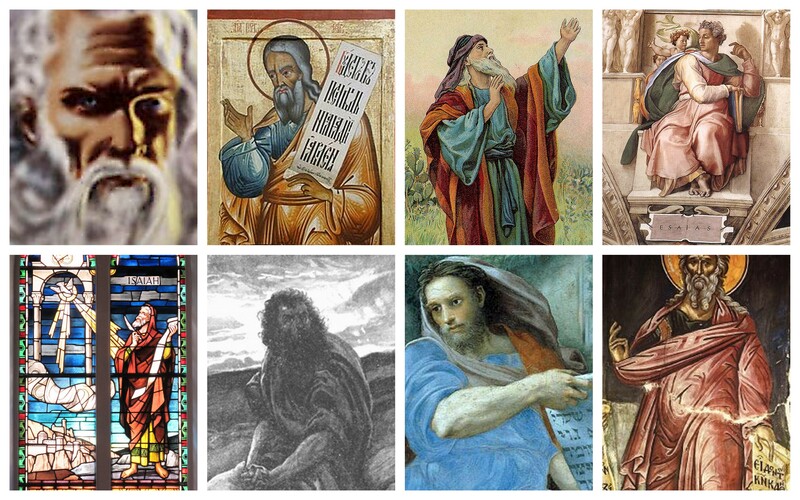 A quick collage of pictures of the Prophet Isaiah, on his good and bad hair days. Stern looking gentleman, without a doubt, which he probably needed to be, considering the mission he was sent on. Try telling this man a 'knock-knock' joke. Behold, I have engraved you upon the palms of my hands; your walls are continually before me. Yes, I acknowledge that the commentators all say about the same thing: that it alludes to a custom of making a mark or wearing a mark on the hands to signify something. Such is scholarship. Sometimes, we hold God’s love hostage to our understanding or comprehension of it. What if we take Isaiah 49:16 at face value? The human palm is etched with lines. These lines, according to some cultures, have meaning too. 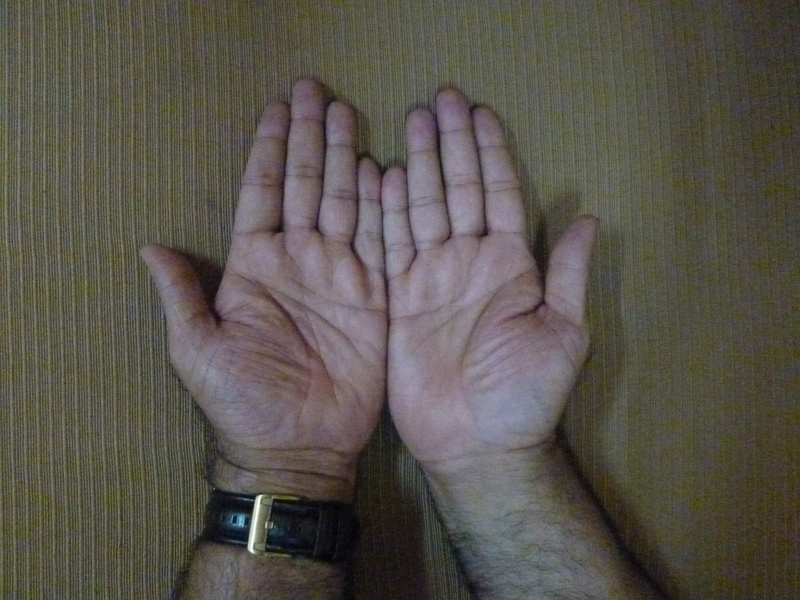 Palmistry (disapproved of by scripture, or our interpretation of it) maintains that the lines change every 6 months. Astute practitioners of palmistry bring a variety of learning to bear on reading these lines. Maybe God is paying us a fabulous compliment: that you and I are individually ETCHED on His hands as His destiny! Ooooooooh. Awesome! I have no problem with the romantic notion that you and I were etched on the man Jesus’ palms too. That He would erase our sins and free us for all time was ETCHED on him. I love the reassurance that He knows my limitations, and He keeps them in mind all the time. It tells me that when I fail, or fall short, He knows what I can do and cannot. He is perfectly aware of it ALL. I don’t have to swan around frantically meeting some ethereal moral standard. When the moment comes, I am required to confess and I can get up and go on. Pictured below, my palms …. 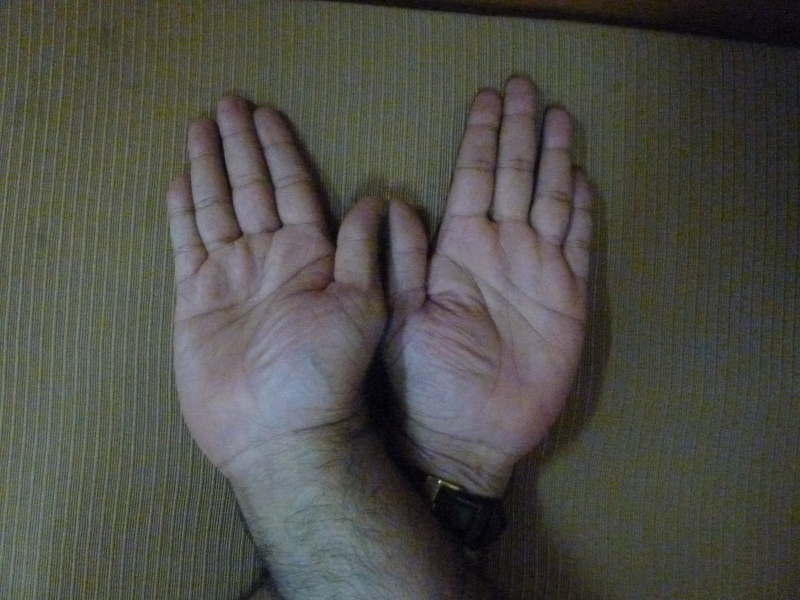 CROSS your hands and look at your own palms .... your lifelines suddenly become the pointed arch of the A in Alpha and the circular arch of the O in Omega. We really have been 'fearfully and wonderfully' made. Hey, check it out …. A workman that needs be ashamed …. Too much time has passed since I last posted. I was unfaithful to a commitment. Yet, God was unfailingly faithful through this entire time. Not one moment went uncovered by His Grace.